Not all classics are created equal—that goes for both kid’s and adult titles. And a lot of old favorites don’t hold up over time. It isn’t exactly news; I talk and write about this fact all the time. Only, I’ve had occasion to relive the truism in the past few weeks, as I’ve read the first three Anne of Green Gables books out loud to Ada, beating my head against run-on paragraphs, incomprehensible Canadian-Scotch sayings, and obscure quotes with even more obscure meanings. But, the humor is still in there; you just have to work for it. I never read it as a kid. Although had I, it certainly would have been an instant favorite. 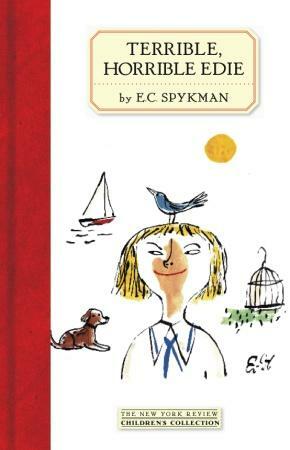 The eponymous Edie is precisely the child I wished I were: a brave, impudent, dog-owning sailor who is never at a loss for something to do. And her misfortunes are the kind that constantly befell me: camping out under a swarm of rabid mosquitoes, getting stuck in never-ending cycles of rut, having my intentions constantly misunderstood. I like this book so much that I have refused to read it out loud to Ada (even though I’ve been secretly hoping she’d insist, so I could get in a quick re-read). She deserves to squirrel it back to her room, under the covers, and discover it all for herself.